At the end of July, Ellie and I finally saw all of our recent PR efforts come together as the much-loved, two-day event Holkham Country Fair took place. For the past four months we have been working hard to create and maintain the brand awareness for the event through numerous press releases, competitions, meetings and media accreditation. Despite heavy rain hitting parts of Norfolk the night before, the event went ahead as planned and it really didn’t disappoint with almost 35,000 people coming through the gates to see an array of countryside attractions, stands and non-stop entertainment suitable for all the family – including the four-legged friend! It was also great to see lots of local and country-focused media come to support the Fair across the two days including Mustard TV who filmed this lovely video, Eastern Daily Press, BBC Radio Norfolk, and Countryman’s Weekly. 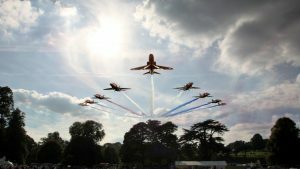 Our highlights were definitely the amazing headline acts; the Royal Air Force Air Force Aerobatic Team, the Red Arrows and Dzhigitovka! – The Way of the Cossack Warrior. Both were incredible! We are literally counting down the days until the next biennial Holkham Country Fair in 2019.